For our last day of summer we visited another market and had another ice cream. 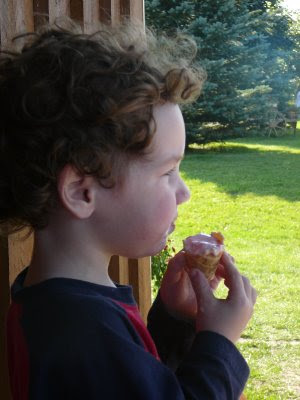 William did love his raspberry cone but he looks so sad, as if he realizes that within several hours, his third summer will have come and gone. But! Not to dwell on anything too melancholy! My new project is going to start today with another post. Just wanted to set it up first. Based on the idea found on this here; http://soulemama.typepad.com/soulemama/2008/01/30-days-of-the.html , I am going to start a daily post that shows just one little, special part of our day for the first 30 days of fall. Days Of Autumn 2008 -- here we go! It's gonna be a good one!